Hey there, my name is Mike. And I’m a pinball-aholic. My 12-Step program calls for me to try to assemble up to 40+ pinball machines in order to open a modest retro-arcade/museum in the Gulf Coast area. What started out as me simply picking up an old pinball machine I used to play as a kid, has exploded into a very time-consuming (and fun) hobby. I enjoy sharing my interests with others as well as my knowledge, and I’ve gained so much from others in the community that I thought I might give back. My idea is to video and document my “first person” experiences acquiring and restoring old machines as well as other aspects of the hobby. PinballHelp.com endeavors to be 100% original content – I’m not looking to cross-post stuff from other sites. I’m looking to create all the content you see here, so this should be fresh and original. There may be some exceptions in cases where, for example, I post funny classified ads for games, or reference a video or two from YouTube as reference for a story, but for the most part, I plan to take all my own pictures, and shoot all my own video, and make it available here first. Speaking of video, as you might notice, as of now, my videos are not really edited. They’re kind of “low-fi” and I am specifically aiming to make them “non-slick” and “real”. Also that’s the excuse I’m using because a) I don’t really have a video editing system in place right now, and b) It takes a lot more time to produce slick, edited videos and I want to “keep it real.” I hope you enjoy my work and that it’s not too tedious or boring. In any case, I welcome comments and feedback! NOTE: This site is not meant as any kind of serious “how-to” guide as much as it is a diary of my experience working with and enjoying classic pinball games. I do my best to try and be informative and educational, if not downright “preachy” sometimes about how to do things properly, but I will be the first to admit I don’t always do everything right the first time, especially the first time when a camera is running. If I had a fancy-schmancy video editing setup, I could make it look like I was a super-pinball-repair expert, but alas, I’m not. I’m just a guy who has had to learn things the hard way, and I thought, why not document my learning process on the Internet? So you get to see me make some goofy mistakes that if I were smarter, I’d never admit to doing and delete the video. But that’s how we all learn right? So please bear with me if I do some kind of repair that garners a glaring look of disapproval – leave some feedback and we’ll both figure out a better way! Love your site. I just picked up a Bally 8 Ball champ that is giving me. Some issues blowing the 1 amp slow blow fuse on the playfield coils. for the coils is integrated. Anyway wanted to tell you great job. Thanks for the kind words. I am not totally familiar with that game, but if there are diodes on the coils, you might want to check them as well – sometimes the coil can be good but the diode causes a fuse to blow. Clay had a page up at pinrepair.com outlining some ways of troubleshooting these things but I’m not sure if all the pages are back up yet. He’s been going over them re-writing the tutorials. no music. Hope mine has a Pot issue like yours. I’d definitely look at the pots first, and also note there are 3 pots – two on the S&T board and 1 on the coin door. Any of them can have problems. The caps on that board are definitely candidates to be replaced simply based on how old the game is and the fact that they dry up and begin to lose their effectiveness. Also check the connectors and look at the ICs to see if any pins might be damaged or dirty. I’m still trying to ferret out one minor problem with my MMPM game right now.. the sound works fine except certain phrases come out garbled. I am confident it’s one of the chips on the board but not sure which one. This is a case where if someone intimately knew how the board worked, they might have an idea which specific chip is at fault, but in lieu of that, I am going to have to play Sherlock Holmes and try different things until I figure it out. This is one reason why having more than one game/board around can be so helpful. I may end up stealing some chips from my other game to test the sound board. Good luck with your project! Well I just found out something interesting. was register 28. However while flipping thru the pages I a 2nd supplementary sheet fell out of my manual stated that the sound function for German was 28 the sound setting for US is 27. So I set it and it’s working great. So maybe you need register 27 not 28. In hopes you might be right I swapped out all the diodes on each coil. diodes and resistors on the controller portion of the board next. It’s possible that in the past some leaking batteries may have damaged contacts either on the battery holder itself or on the circuit board near the battery holder and this is causing that issue. I’ve seen that happen with other games too. Adding a new remote battery pack may solve the issue. what can it cost? a circuit board? me i ask you a question? what do you think of this pinball machine? Interesting game. I’ve never seen that before, or heard of the manufacturer. Any idea how many were made? Great website and videos. I also enjoy pinball machines very much. You really explain procedures clearly so anyone could attempt their own repairs. I have a Bally Mata Hari pinball machine that has been working great until one of the slingshot solonoids now stays on. I have preformed the test for all the solenoids and they all work except for this one that just stays energized. There are no broken wires that I can see and the 2 switches behind the rubber bumper seem to be adjusted correctly. I have gone through your site and did not see where you might have run into this. Maybe you might have some ideas for me to try. I do have the original manuals and am very mechanically inclined but am not very good with electronics unfortunatly. If a coil stays energized/up you first want to make sure whether it’s electrical or mechanical. If it goes down when the power is turned off, then it’s electrical. The thing to do is follow the wires and make sure they’re hooked up properly. The reason the coil is firing is because it’s grounded somewhere. Somewhere between the actual coil itself, and the transistors on the driver board that fire it, is being grounded. It could be the transistor(s) on the driver board. Find out what components on the driver board handle that coil, and test them to see if they’re bad. You might have to replace the driver transistor in the circuit. Thanks for your reply and advice on what to check. I will look at everything in that circuit to determine the problem. Will let you know when I get it fixed. Enjoy collecting and repairing pinball machines! I am in the process of working on my first pinball machine, Mr. and Mrs Pacman. I have came upon a snag. All the connectors were pulled off the boards and I have no clue what connector goes to what board. I have noticed that on the connectors that some have like a blocked hole in the plug and there is no prong on the circuit board so I am guessing that some connectors can line up like that. But I am lost, why couldn’t they be marked. Could you please help me out maybe some photos or something. The blocked hole is called a “key” – that’s used to help determine which connector goes where. If you are still having problems, let me know more details and I can try to take some specific pictures of certain parts. Thanks, I am still having some issues with what connectors that go onto the talk and squawk board and is the J5 connection on the MPU board suppose to not have any connectors? Also could you tell help me with the back glass lighting. It seems like this unit runs on fluorescent tubes, three of them? Also back on the subject with the MPU board, where the battery is, someone did a hack job and seemed to leak solder onto other traces but need to clarify this with you. Is there a way I can send photos? It sounds like you need to have someone locally take a closer look at the board. You could have multiple problems. I was watching your videos on repairing the Bally Squawk and Talk and you have a AS2518-61 or AS2518-61a while I have a 2518-61b. I can not figure out what pin connectors go to what “J” connections because none of the remaining pin connectors fit. Plus there is this two pin connector that is connected on your J2 connector with remaining pins showing, so when I connect that same two pin connector there I have more pins showing than your board. As a side note I am also missing the solenoid/voltage driver board so I have unused connectors. If you need a picture of any of the connectors, let me know – I can probably help with that. But if it’s a different game, things could be slightly different. The game is still mr and mrs pacman, yes I would like pictures of your connectors for the squawk and talk please. Thank you for the pictures. I think I might have figured out what my problem was. Since my board was the revised “61b” version to accommodate Centaur or other games that is why I am guessing I have more pins in the “J1” and “J2” pin rows. I guess I will wait in see when the voltage regulator/solenoid driver board comes. You were right, it was a transistor. I took the board to a friend and he replaced it so the coil is no longer energized but now there is no power going to it. I may purchase the replacement circuit boards with the lifetime warranty in the future to get her going 100%. Awesome! Glad you got that working! On your Mr and Mrs Pacman what are the three fuses located on the underside of the playfield? on the power supply board or elsewhere? are you looking for the value of the fuses? There are three fuses on the underside of the playfield right above the score display between the flippers. And yes I am looking for values. I recently bought my first pinball machine, Spring Break (Gottlieb 1987) and the right flipper was sticking once in a while. I stumbled on your videos on YouTube and think you do an excellent job of explaining repairs to someone like myself with very little experience with technical repairs. I am continuing to do research before opening the machine up, but I think you provided me with a great start! Thanks for doing what you do! That’s exactly what I did. I did a whole video series on cleaning the score reels. Just got into trying to fix pinball machines. i’ve been playing for a while and play in my city’s pinball league (Pittsburgh, PA) I’ve recently purchased a Williams Granada pinball machine to try and fix. I’ve been watching your videos to learn all about everything. You do a great job! The problem I have with my Granada machine is that as soon as I plug it in, the game just keep running the motor and it never stops. The score reels are at 0, and I keep looking around to try to spot problems. I have a bunch of pinheads that can help me out, but I thought I would try here first to see if I can do it myself. I plan on taking photos and videos of my pinball repair as well, as I know members in my league want to see how things are going too. So the score motor keeps turning even though the score reels are all zero’d? I’m not an expert at EMs but I would still look at the score reel switches. It may be that one of the “zero position” switches has some crud on it and is not making contact so the game doesn’t know the score reels are reset yet. There may be other tasks the game is performing that force the score motor to keep running but for sure, the score reels resetting to zero is typically one potential culprit. Thanks for the quick reply. I’ll run through and clean it all up later today. I’ll let you know if I find anything new. The motor runs without me even pressing the start button. I just plug the game in, and it goes. Hmmm, that could be a playfield switch stuck down. Check to make sure a rollover or target isn’t stuck. I went through and checked all the rollovers/switches, and nothing appears to be stuck down. In the backbox, the score reset relay keeps moving, and then the ball count unit continually clicks in 5 round bursts. The score reels are already reset to 0 and in the zero position, so when I turn them manually, they reset back to zero and then stop. if the score reset relay keeps moving, I would guess one of the switches on one of the score relays is off. the problem is, there may be no easy way to figure this out. What I ended up doing whenever I work on these machines is methodically go through and clean all the contacts, being as careful as possible to not throw anything out of alignment. Well, the game stays off when I turn the power on now. the coin door has a solenoid on it, and it appears to be “on” when the game comes on, so the game gets kinda locked up. When I manually activate the credit switch, it starts a game up, ejects the ball, and the flippers and playfield work! I need to replace the coin door mech, that’s for sure. Its pretty rusty and such. Also, the backbox lights are off, but turn on when switches are hit and whatnot. I gotta find out whats causing that as well. Was watching some of your vids on YT and enjoyed them much. Was hoping to pick your brain with regard to a couple things. I just picked up an old Bally Wizard table (loosely based on the Who movie Tommy). All in all it’s in working mechanical shape. But . . .
(1) The main issue is the play field inserts…they’re uneven and loose. I watched your video on how to re-seat those but in the case of mine it seems they kind of rattle around in their hole. Do you have any advice for leveling inserts that don’t fit tightly in the holes? I thought of doing what you did but at the same time applying pressure with something from the bottom to ensure that they’re pushed level against the flat board you’re putting over the top. (2) My machine has some clear (I think Mylar) play field “shields” that I believe were placed on after the fact in order to, I suspect, protect certain high traffic areas of the play field. The downside is that they can affect the trajectory of the ball, especially when it’s moving slower. I’d like to remove these but I’m assuming they’ve been on for a while. Might a heat gun work for this and then perhaps some Wildcat Tape Remover to remove any residue left over afterwards? That’s a good question. I’m not sure what to do there, but you might want to try some kind of wood filler around the inserts. I’d do more research. As for removing mylar, the most popular way is what’s called the “freeze spray” method – don’t use heat, use cold and turn a can of compressed air upside down and freeze the mylar with the coolant, a little bit at a time. If you google something like “freeze spray mylar pinball” you will probably find some videos on it. I haven’t done one yet on that subject but I will soon when I pull the mylar off my Earthshaker. On that Mr. and Mrs. Pacman, which rom chip was causing your sound problem. I have a machine with the same problem, startup sound just like your and some of the speech is garbled. Phrases like “go for”, “p”,”a”,”c”,”m”,”a”,”n” are good. “pacman saucer”,”pacman: are garbled. Best site ever! videos are great, very entertaining and educative. Hi there, great site! Man, I hope I didn’t screw up! I found a Firepower 2 at an estate sale last week and it’s in really good condition, except for the one loose green wire in the front door that just sparked for a millisecond. Now all the solenoids are not popping. No obvious fuse blown, although I’ve only checked the ones on the main board. I’m a newbie and hope all is not lost. Any ideas? Thanks in advance! That’s a tough one to diagnose remotely but I’d check all the fuses and remember, look over the machine thoroughly to see if you notice any wires or connectors out of place – try not to do things like lift the playfield up with the power turned on until you are confident that everything is in place. usually if you ground something out, it will take out a fuse — note there are fuses in several locations on the machine. Most of the European games will run fine on American power. Although if it hasn’t been converted already, there could be other issues – A Getaway is a pretty desirable machine but also one that tends to get a lot of play and have a lot of wear. If you can find one under $1000 it’s probably a good deal if it’s working and has no major wear, but I’ve seen those games go for $1500+ An EM is a fun game to learn on and very reliable once you iron out the kinks. My advice would be to look for a good deal first and be patient and something will show up. Hi Mike been watching a lot of your video’s lately. I just watched replacing a battery box in your machine video in you tube. I have a TAF that I want to add an extended box too. I have the same box as in your video. MY TAF has bad corroded connectors on the battery pack that I have neutralized and won’t work reliable any more. OK I am using rechargeable’s and I want to add a diode inline so it recharges when the machine is on. Which lead do you attach the diode red or black? Also which way round does the diode go? The silver line nearest battery box or machine? Thanks for your great video’s! I have a reset problem on my Stern Simpsons pinball party , i tought maybe you could held me.I had one or two random reset in about 2 month but since the last reset i cannot start any game. Each time I power on the machine its like trying to boot and resets immediatly .. If the game has been in the same spot and it has started doing this, it could be some capacitors on the board that are filtering the power for the CPU. I haven’t done a lot of Stern work just yet so I don’t know how similar it is to WPC games — I’m still learning myself but I know on WPC games there’s a watchdog circuit that makes the game reset if the voltage drops, which can usually be caused by failing capacitors on the board. – Often (but not always) after playing the player/ball number does not change (it plays still the same ball at the same player). – With Player Number 1 you can’t get any credits with points (score level). With the other 3 players it works fine. Do you have any idea? Thanks very much for assistance (maybe direct to my mailadress?) . Congrats on the system 1 find. I have 3 of them up here in Mass. I replaced 102 connectors on it. Uggggg…. Two of them have Nu Wumf replacement boards in them. I really like them. I picked up a non-functioning Mr & Mrs Pac Man pinball machine and was wondering if you could post pix of the power board in the lower cabinet wirh all associated wiring included. Mine has a few disconnected wires with no obvious places to hook them up. Before I fry something, I’d like to see how it should be. I have schematics but I am wary of possible rewiring from previous owner! I’d like to help, but I can’t get to my game just yet – it’s stored away, but if you remind me in a few weeks, I’ll try to do that. I’m sorry about that. Thanks for your Gottlieb Charlie’s Angel video, was very informative. You would be able to give me an indication of what a fair price for this machine would be? Is the market also different around the world? It’s hard to gauge pricing, but currently the prices seem to be going anywhere from about US$200 on the low end to $500 on the high end. A pristine version could command higher prices. A non-working game is IMO, at best worth $100-$200. The amount of time needed to get these games working again makes it difficult to value because in many cases it will cost more than what you can resell the game for in order to get it working, especially when you take the value of your time into account. Another example of how pinball is more a labor of love. Just wanted to let yo know your videos are GREAT. Always look forward to a new installment. Thank’s for your help and quality videos on your web site! I am working on a Bally Mr & Mrs Pac Man. Right side flippers were sticking. Cleaned the plunger and all the contact points on the end of contact switches. I also cleaned the contact points on the flipper button. The flipper now works much better, sticking only occasionally. But, now the PacMan playing field will not light up. It was working fine before I started work on the flipper. Now, there is nothing. I had to have done something to make this happen. Do you have any advice? Another great video from you on attack from Mars. I’m currently chasing a similuare issue on a williams pin called Pharaoh. game when I push the start button. I’m thinking it is a switch matrix problem. Have 1977 Bobby Orr Power Play. I purchased a new MPU and recitifier power board. Upon start up the 1amp under the play field fuse blows. I replaced the saucer kicker coil along with a new diode and also replaced the transistor on the solenoid board. The fuse still blows and takes out the transistor! I seem to be getting continuity through the wire from the transistor but also at other locations on other coils through the same wire! Do I have a short or wiring harness issue under the playing field or??? Recently buyed my first system 80 game , Haunted House with Pascal Janin board in it, the game is not booting and have no display. All fuse are ok , GI are lighting , i can hear some attract mode sound. But no display and boot , do you have any idea ? i am planning to start with re pinning all the connector going to the board …. Can you point me in a direction! ’77 Jet Spin – all working perfectly except when the bonus score is not being added to the reels! As bonus is collected bonus rota works correctly lights go on etc. When ball goes out bonus rota reverses correctly decreasing bonus score lights – but the 1,000 do not get added to the players score. I’m new to this. Any idea if there are schematics available for a 1943 gottlieb EM? I just got a Shangri La and it lights (a little) but I don’t quite know what everything is. Or where to start. Love your Art Deco style machine! Just wanted to tell you what a great website you’ve got; and the YouTube vids are super …they were a great help in figuring what’s gone a little bonkers with my machine. I also have a Gottlieb “300” machine …my first and only so far. It’s a 4-player machine and was apparently originally built as an export model. It has “Manufactured for Mondial built exclusively for export” stamped into the bar where the coin slots are. Inside, the main board has “Belgium” stamped on it between the game counter and coin unit. I have no idea as to the history of the machine. The guy I bought it from just wanted to get rid of it (actually I think he had an ultimatum from his wife) and really didn’t tell me much. Maybe some day I’ll scrounge the internet an look up export pinball machines. At the time of purchase the machine worked, the instruction manual and schematics were included and the play field and back glass was (and still is) in very good condition (just a few bits of peeling ink). I did some basic maintenance on it when I got it home (new power cord, new rubber, adjust the flipper EOS, replaced all the bulbs, waxed the play field); all was good. Recently I decided to re-connect the game credit solenoids so the machine would require dropping quarters to fire it up. Yeah, I know, why fix it if it ain’t broke. But. like you, I wanted to get it back to an original playing status and the credit score wheel was just something I thought would be cool to have working again ….see the credits rack up with winning scores and matching credit …the thrill of victory, the agony of defeat …that sort of thing. So I re-soldered the power leads to the increase and decrease solenoids. And unlike your “300” that was stuck on one player, mine is now stuck on 4 players …but shows three on the backglass. My online research led me to your “300” vids and sort of confirmed what I suspected might be askew: the coin unit. The play field also suffers from sunken light lenses; I was happy to accidently stumble on your tutorial on how to restore them. But, as you probably know, 16 of the 21 lenses on the “300” have “When Lit” printed on them. Ugh. And yup, they’re bad enough where they will cause the ball to hang. Any guidance or direction you’ve discovered to restoring the printed lenses besides coating and sanding them? So for the time I’ll be checking/cleaning the coin unit and at least restoring the plain 5 in a row play field lenses leading to the spinner. I do like your philosophy with regard to “restoring the machines”: I’d rather have a playable machine than a pristine museum piece. I have a 1977 Gottlieb Bronco EM that plays great. Last night I was changing some lightbulbs and now the playfield lights don’t work (although oddly the “Extra Ball” and “Special” lights will light occasionally when playing it. It plays perfectly still, and the backbox lights are working. Just the playfield lights don’t work. I checked the 10 amp fuse for the playfield and it was blown and it’s blown a new fuse as well — so something’s shorting it out. Any ideas? I have removed all the bulbs I added and tried it without bulbs in those sockets, but still blew the fuse. Any ideas would be a help. I am a total newbie and am bummed about the idea of hiring someone to come fix it, but I think I will have to. I recently bought a Bally Radical pinball machine. I would like to change the sound and display ROMS. Is there a possibility to program those on a custom basis? Do you have a tutorial video for this? for example… with a different text in the display or a different talk / music? I only saw the mr and mrs pacman ROM reinstall video in your youtube channel. Hi Mike, I just got a 1975 Gottlieb “300” which is in, overall, pretty decent condition. I was watching the videos of your “300” and its great to find someone who is so knowledgeable and explains everything so well and so clearly. Maybe you can help me with this one problem my machine has. First, I should tell you I’m very new but not mechanically helpless. 🙂 So what’s happening is the machine doesn’t reset the scores to 0 when I press the Play button. Is there a reference or any instructions you can share with me that will help me fix this? Thanks very much for a great video series! That’s probably one of the score reel switches – I have some videos on working on them here. Search for “score reels”. I have a 1982 Haunted House by Gottlieb. I love this machine it is great and brings back many fond memories. The machine is in near perfect condition except for one issue. When a new game starts the ball kicks up normally. However, when the ball drains during a game, it will not kick back up. Any insight or ideas on what may be going on here? Possible fixes? It looks more like a table top / trade stimulator than a traditional pinball machine. Not sure what the value would be but I wouldn’t think more than $100-$200 at the most… and possible that it’s worth significantly less, but anything rare always has a potentially high price to the right person. you can tell how you solved it? Doh! Unless that game has already been serviced, the most common issue with those early Bally solid state games is the NiCad battery on the main board begins to leak and damage the board. 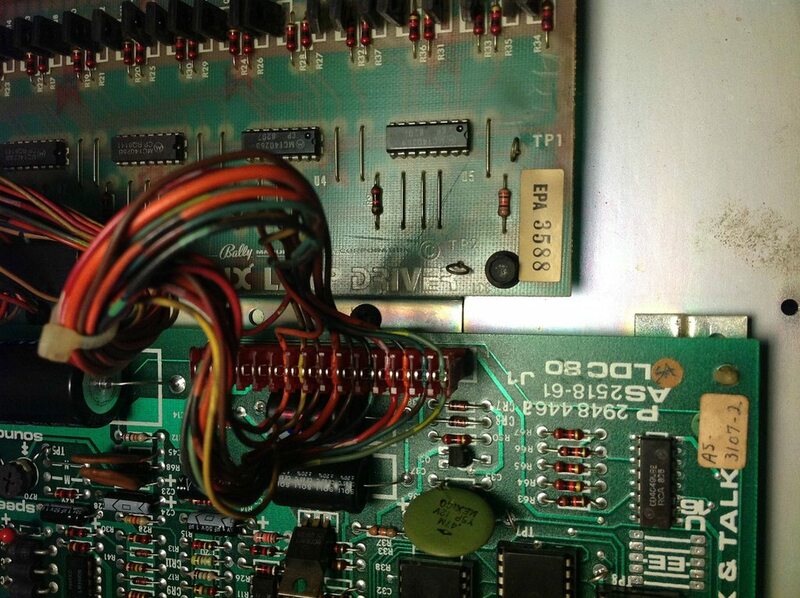 I’d look into that right away – it may be cheaper to get a replacement Alltek board if that’s the issue. 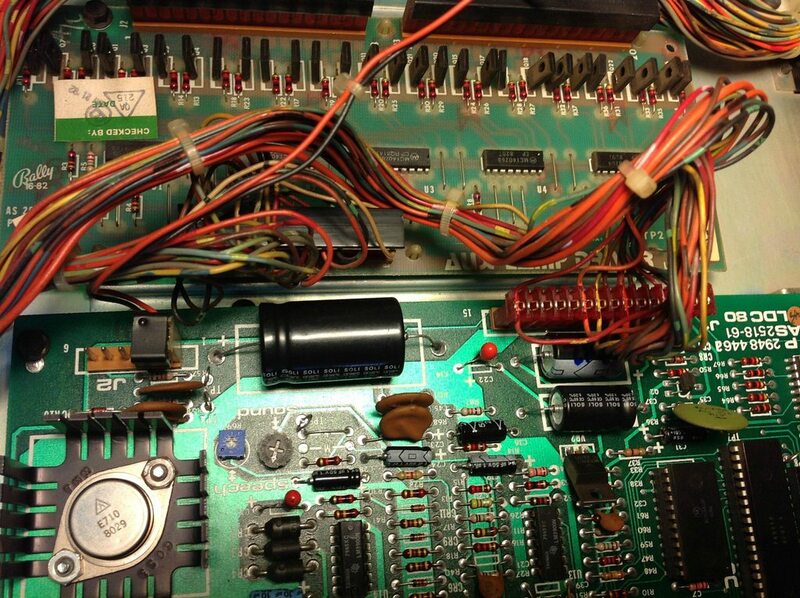 Look inside the head and there’s an LED on the main board that should blink 7-8 times before the game boots up. If it blinks less, there are problems. Hello, I like your website and want to say thank you! You keep pinball alive. I learned much things from you. Your videos are always informative and entertaining. Keep up the great work. Greetings from Germany. Thanks for the kind words! Much appreciated! !